Have you spotted Marisa Tomei, Robert Downey Jr., Charlize Theron, The Rock, Vin Diesel, or Helen Mirren? A sign points toward a basecamp for The Leisure Seeker in Dunwoody. Spider-Man: Homecoming (production code: C) is currently the big film on the block. Starring Tom Holland, Marisa Tomei, Michael Keaton, and Robert Downey Jr., the next installment in the Marvel Cinematic Universe has been busy throughout Atlanta this month. Spider-Man closed out June at Grady High School, taking over the location for more than a week. On July 11, Spidey was seen downtown, fighting crime while hanging from a bungee cord. The next day, a hotel scene was filmed at the Perimeter Center Embassy Suites. A nearby basecamp was set up at the Regal Perimeter Point Stadium 10 theater. On July 13, there was a night shoot on Robin Hood Road in Midtown. Crews would continue to work in this area until the 20th, with a second unit working in Piedmont Park on the 15th. More recently, the production has been working out of Pinewood Studios. It’ll be a couple of weeks before you’ll get a chance to spot Spider-Man back on location. Fast 8 (CIPHER) continues to burn rubber and add to its roster of crazy stunts. After a late June day in Perry, crews started July with Dwayne “The Rock” Johnson filming in Gwinnett County’s Bethesda Park. On July 11-12, crews were spotted downtown near Café Lucia, and at Hurt Park on the 13th. (Keep reading to see some of the carnage.) By the 15th, crews had moved on to Northside Tavern for interior shots. Aside from The Rock, keep an eye out for Vin Diesel, Charlize Theron, Jason Statham, Michelle Rodriguez, and Helen Mirren. Vin Diesel filming #fast8 in Atlanta today. Speaking of Helen Mirren, she’s also filming another project, The Leisure Seeker (TLS), which just started this week. The film also stars Donald Sutherland, whose previous Atlanta contributions include The Hunger Games’ President Snow. 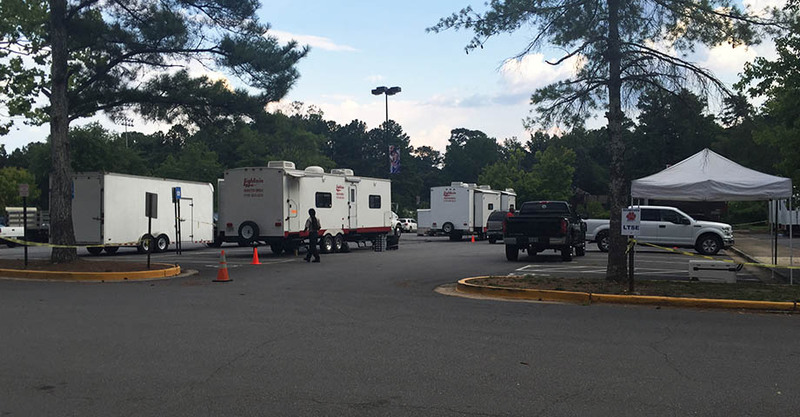 On Monday, filming began at the Veranda Estates apartments near Dunwoody High School. On July 23, we also saw signs for this shoot posted along Chamblee Dunwoody Road. The Leisure Seeker focuses on a retired couple traveling by RV and is based on a novel by Michael Zadoorian. On Monday, a basecamp for The Leisure Seeker was set up at Dunwoody High School. Netflix, which is already receiving praise for the Atlanta-filmed Stranger Things, is working on another series in town. Ozark (BYRDE) has been filming mostly up at Lake Allatoona in a restaurant Netflix purchased. On July 15, production traveled to Decatur, and we saw more filming in historic Roswell on July 16-18. On July 22, a basecamp was set up at the Lawrenceville Church of God. Yesterday, signs were plopped in Norcross. Ozark stars Jason Bateman, who also directs and produces the series. CBS is rebooting MacGyver (EYE), recreating all that classic jury-rigged madness here in Atlanta. Lucas Till will play a younger version of the secret agent in this series, which premieres on September 23. 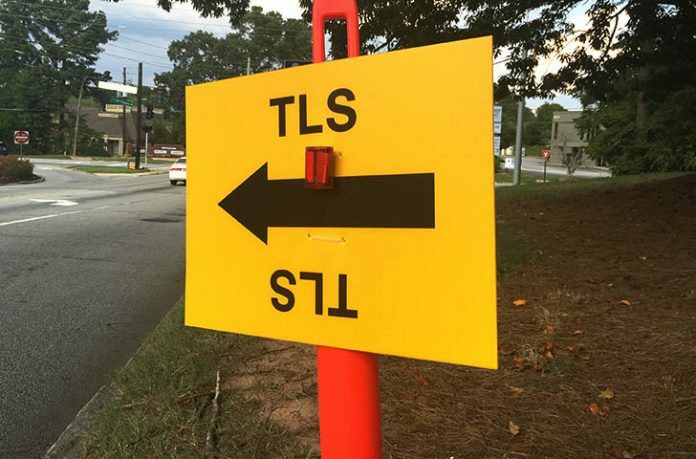 Filming signs were spotted on July 10 in Kennesaw at the corner of Roberts Road and Old 41 Highway, and at the Swan House on July 14. Oh, and during the CBS Comic-Con panel this past weekend, executive producer Peter Lenkov hinted at a Richard Dean Anderson cameo. The Originals (TOGS) and The Vampire Diaries (LOC) have begun their seasonal filming in Conyers, but Diaries will leave us for good when its eighth and final season wraps. Jacob’s Ladder (JL) shot near Emory’s Briarcliff campus on July 14, Step Sisters (BGP) signs were spotted on Peachtree Road at Oglethorpe University on June 22, and The Yellow Birds (TYB) reshot a scene on Alpharetta Street between Norcross Street and Cherry Way. John C. McGinley’s comedy-horror, Stan Against Evil (RADICAL MEDIA), was in Douglasville on June 21. Finally, two news items this month: On July 19, Hollywood lost Garry Marshall, creator of Happy Days, Pretty Woman, and most recently the Atlanta-filmed Mother’s Day. He passed away at the age of 81. And the fate of the final installment of the Divergent Series, Ascendant, seems to be up in the air. The Atlanta-filmed Divergent Series: Allegiant didn’t perform as well as expected at the box office, and now Variety is reporting the last film will be made as a TV movie, with a possible lead in to a television series. Currently, it’s unknown if production would remain in Atlanta or move elsewhere if the TV movie or series happens. Hopefully we’ll have more to share on this next month, but for now, your guess is as good as ours.